Peach and porcelain as far as the eye can see! That doorway there initially went into what is now Huck’s room, which the former owner of our house apparently used as an entire room for pantry items. 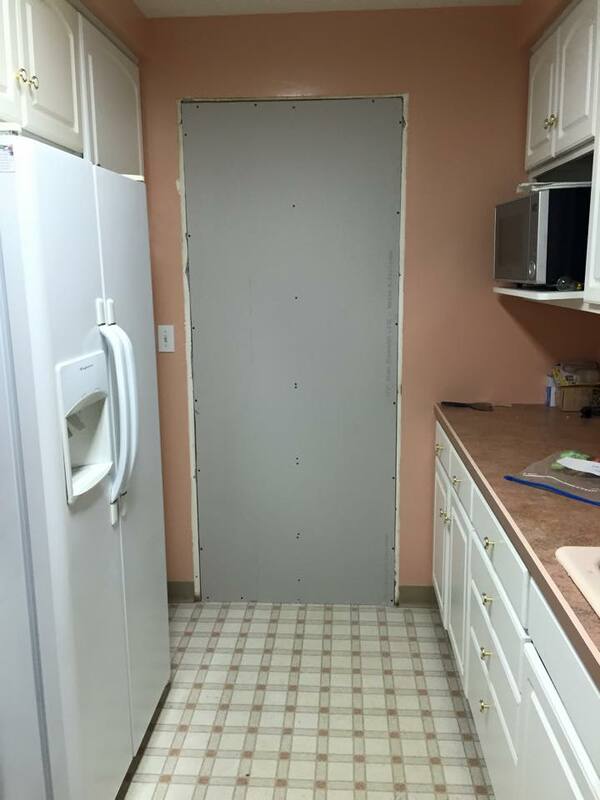 It can probably go without saying that we couldn’t wait to fix this space up. This photo shows some progress along the way. 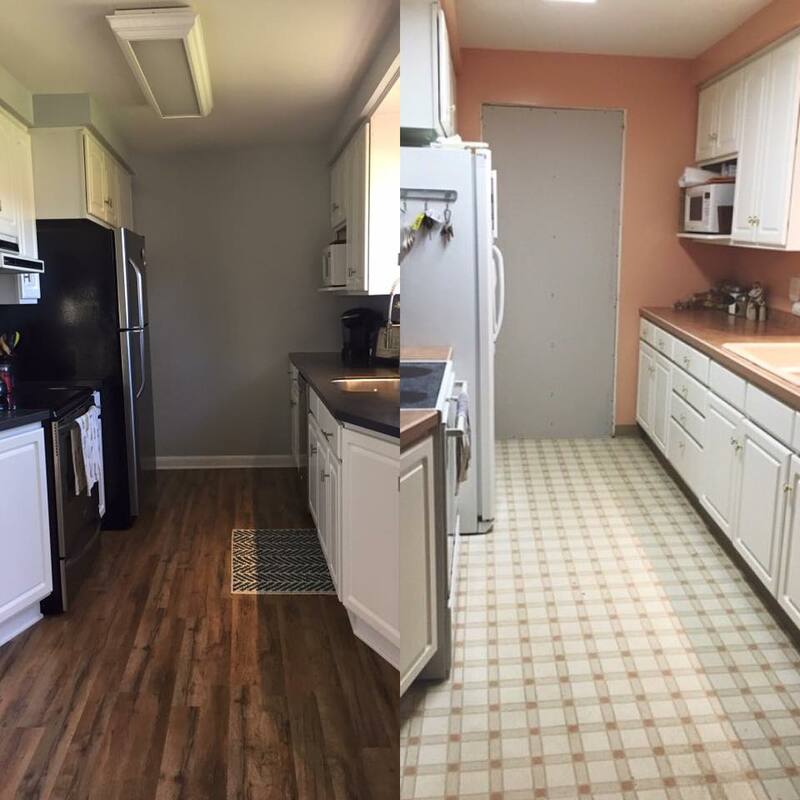 New flooring, countertops, appliances, and drawer pulls. 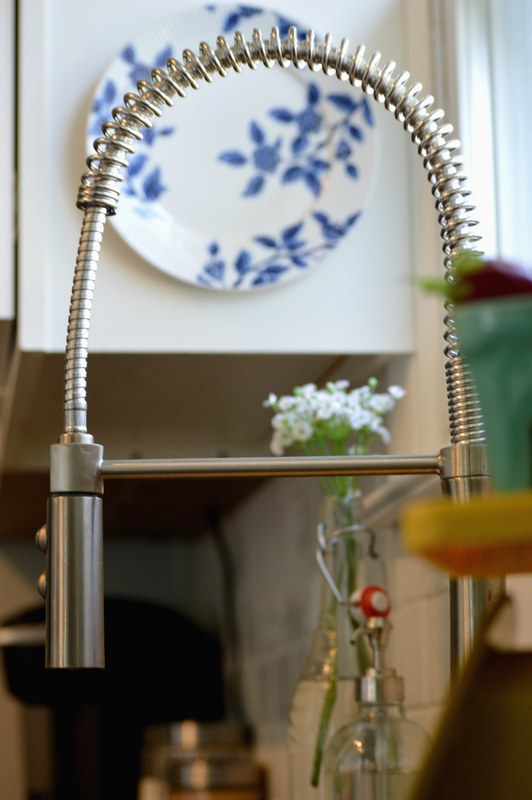 Eventually, we swapped out the giant white microwave/shelf for a range hood microwave above the stove. And alas, here is our finished kitchen! Walking into our kitchen makes me so happy now! 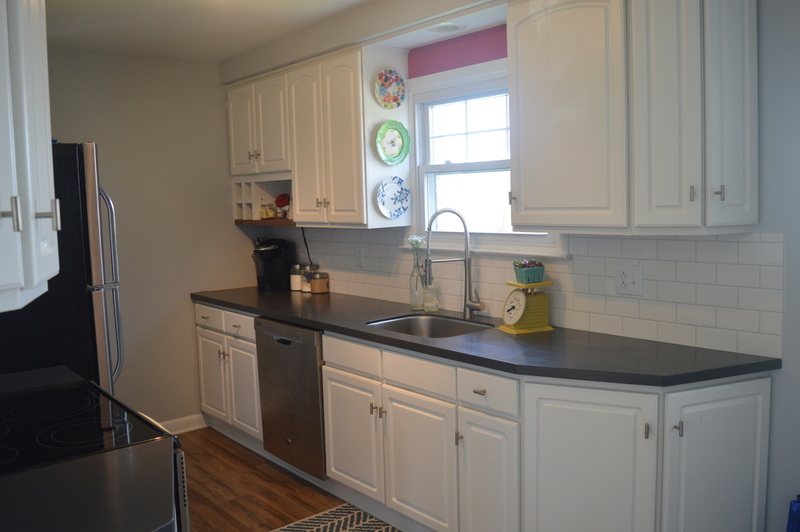 The white subway tile backsplash contrasted by our dark countertops really makes the space look clean and modern. Stark contrast from the peach-hues we started with! 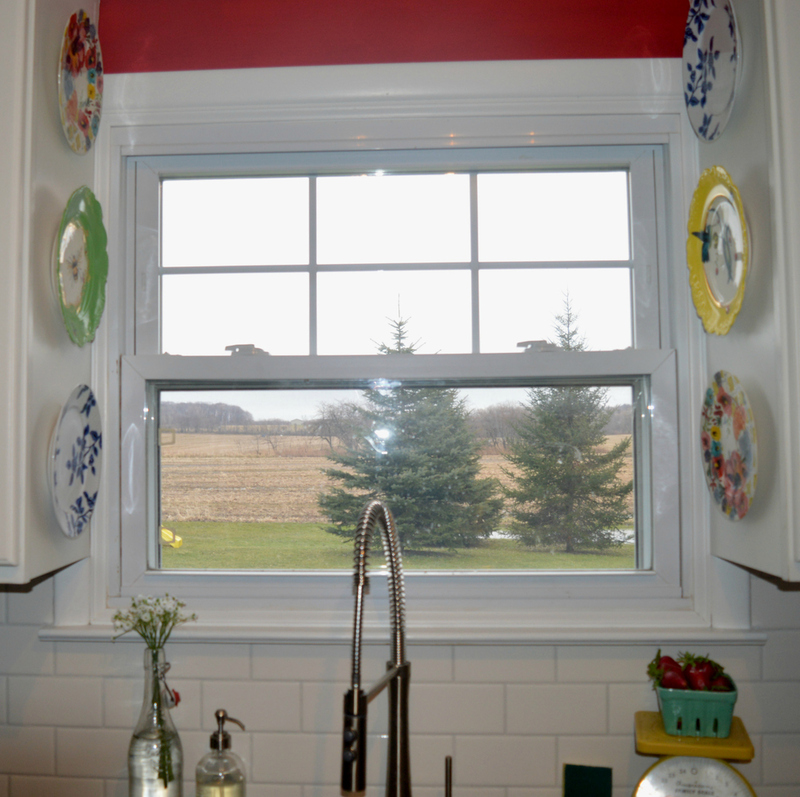 Speaking of contrast… the red paint above the window was 100% Luke’s idea, which I will admit I was a bit skeptical of at first. 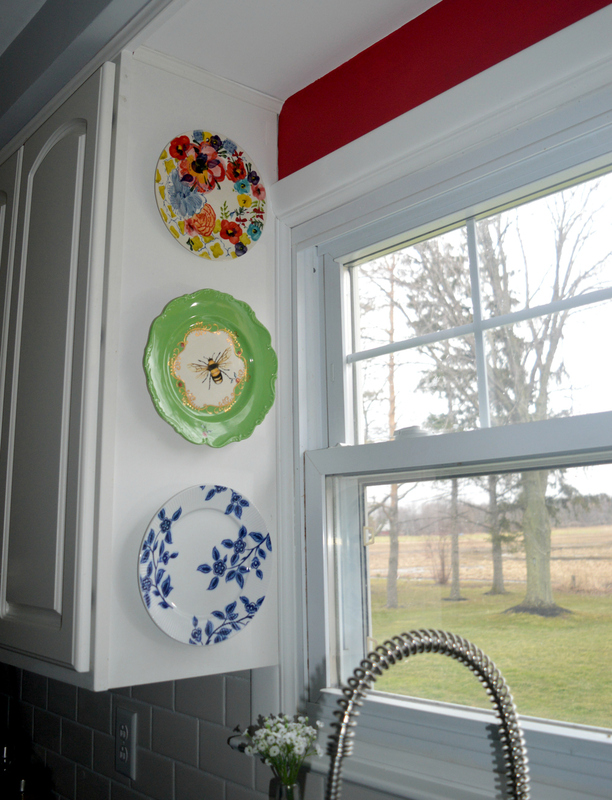 It took a bit of convincing, but once we hung the decorative plates up, the pop of red really tied the sink area together and now I love it! 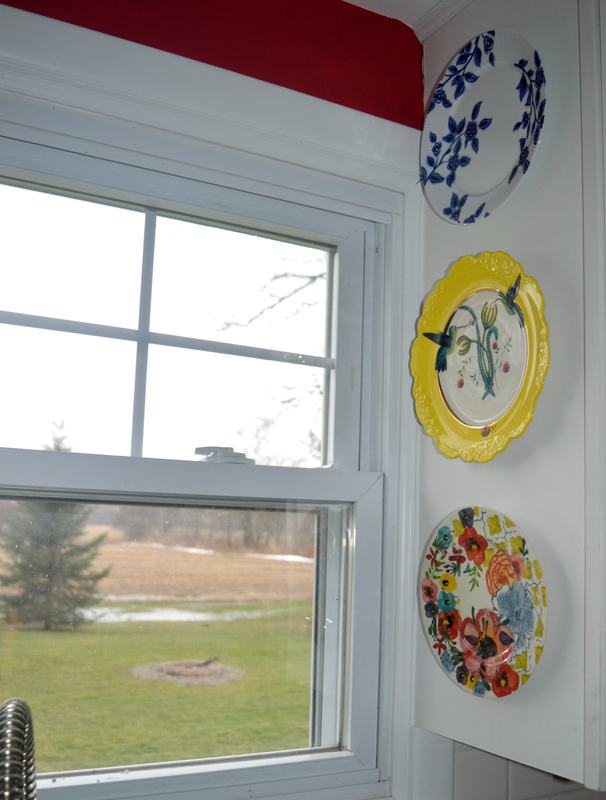 It also matches our dining room chairs, which is a fun touch to bring the two rooms together a little bit. 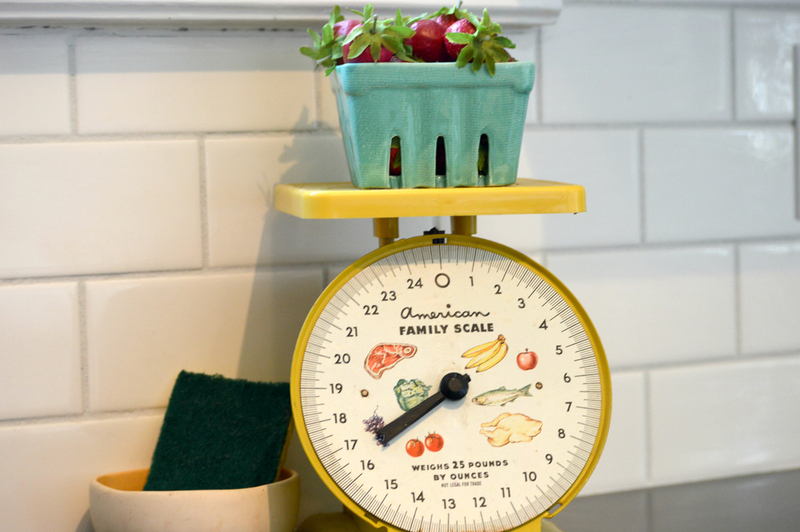 I am obsessed with the plates we got from Anthropologie (my mom got them for me for Christmas and I couldn’t want to hang them up) and the vintage kitchen scale was a flea market find a few years ago that I just knew I would someday find a perfect place for. The market basket is also from Anthropologie, and the fake strawberries (or “apples,” as Huck calls them) were found at Hobby Lobby.Our faucet, sink, countertops, appliances, and flooring are all from Lowes (basically our second home since buying our home). As for the smaller decor items, the vase was the packaging for a sparkling lemonade I found at Aldi (removed the label and washed it thoroughly), and the kitchen rug and hand soap container are both from Target. And there you have it, friends! Our brand-spankin-new kitchen. Luke also built me an amazing rough-cut wood shelf with a built-in wine rack, but I’m waiting to share that until it’s properly styled and stocked! Everything is SO pretty! I’m especially in love with that scale. It’s exactly something I would have picked out for my home! LOVE it! Such a difference. Enjoy!